For some reason I always feel awkward admitting this, but carrots are one of my least favorite vegetables. I don’t necessarily dislike them, but I don’t get excited about them the same way I do with broccoli, brussels sprouts or asparagus. There have been occasions where I’ve had restaurant preparations that blow me away, usually in a roasted or soup variation. Rainbow carrots are particularly good when roasted. I digress. I often have leftover carrots on hand because they’re a primary ingredient in mirepoix, which is used in countless recipes. Since I hate wasting ingredients, I always look for creative ways to use them up. 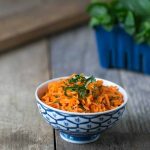 This carrot salad is an excellent way to use up those leftovers, and the addition of mint and lemon makes it a refreshing side dish for spring and summer. I used a vinaigrette from an older recipe: Quinoa, Apple and Almond Salad with Honey Lemon Mint Vinaigrette. You should try that one as well; it’s one of my favorites. As is often the case, fresh carrots have the most flavor, so they’ll work best in this salad. 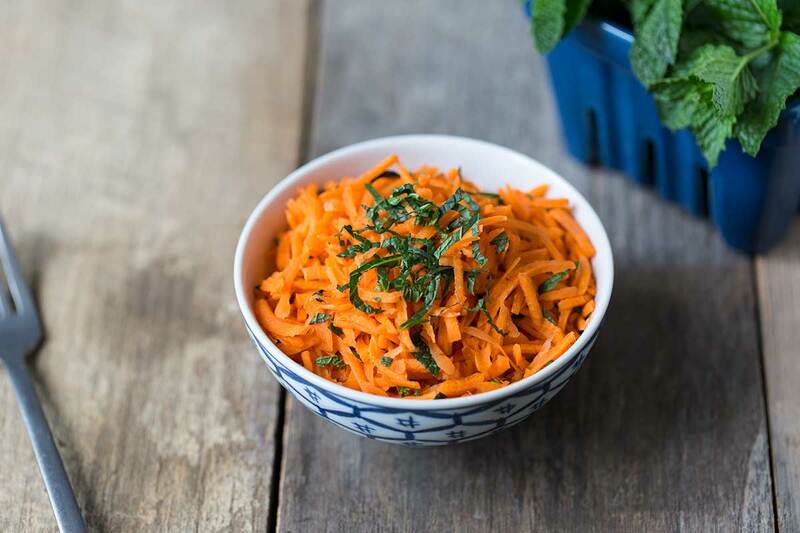 Otherwise the flavors of mint, honey and lemon may slightly overpower the carrots. However, this is also a wonderful way to use up those older carrots, which are full of texture. If you have a food processor with a shredding disc attachment, use that instead of grating the carrots by hand! It’s a huge time saver. If you don’t have one, add a few minutes to the estimated prep time. You can spruce up this salad with additional ingredients. For more crunch, try adding toasted nuts like slivered almonds or crushed peanuts. Raisins or currants would also be a great addition. I recommend letting the carrot salad rest in the refrigerator for a couple hours if you have time. This will give the flavors a chance to blend. However, if you’re preparing it at the last minute (I often forget to plan ahead, so no judgement here), it will still taste great. Check out my Warm Zucchini Salad, Cucumber Salad, and Strawberry Spinach Salad! 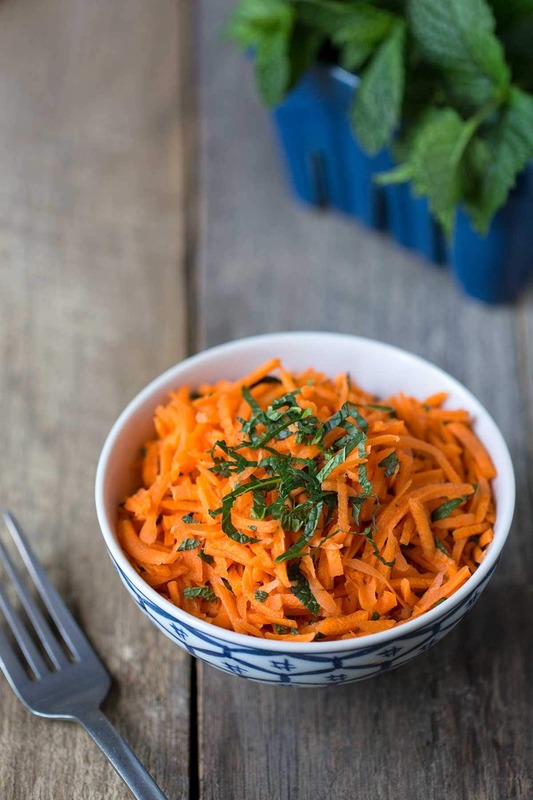 This carrot salad is light and refreshing, making it perfect for summer! Mint, honey and lemon add brightness. This is a lovely accompaniment to roasted chicken as well as a variety of other meals. Add the honey, lemon juice, olive oil, water and mint to a blender. Puree until smooth, 30-60 seconds. Season with salt and pepper to taste. 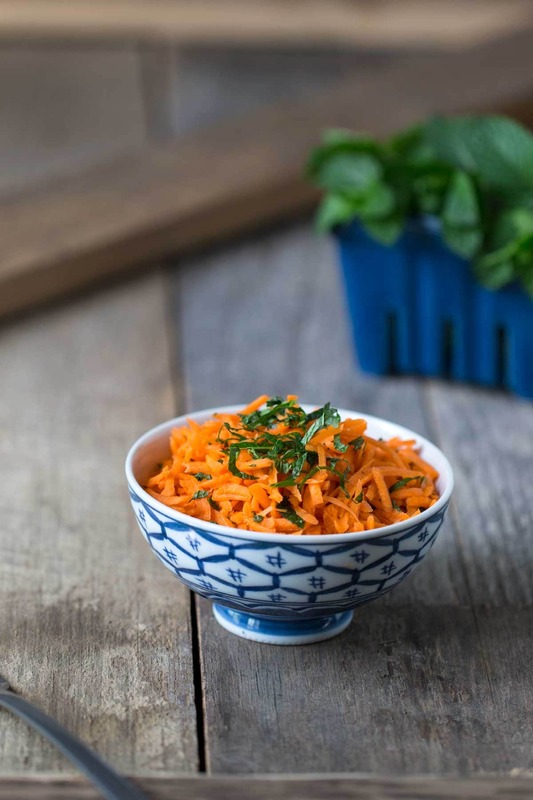 In a large bowl, combine the carrots, mint, lemon zest and dressing. Taste and add additional salt and pepper if desired. Cover and refrigerate for at least 30 minutes, preferably for a few hours so the flavors have a chance to mingle. 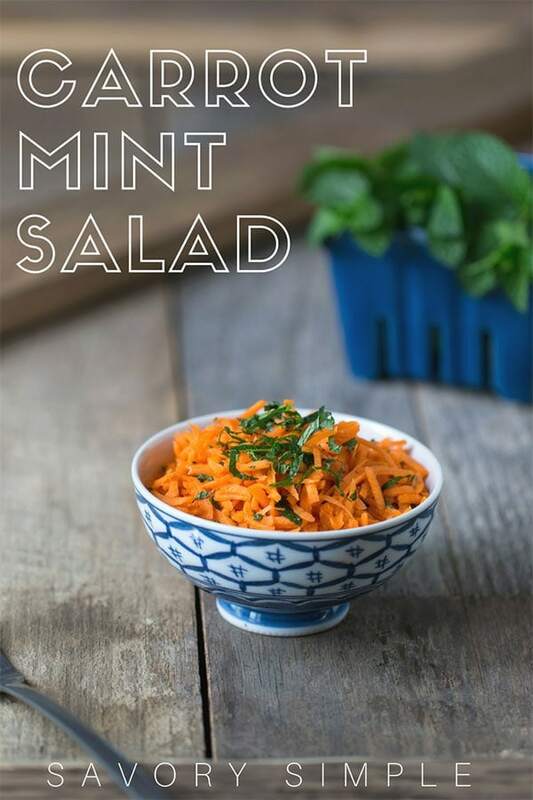 Before serving, you can optionally garnish with a small sprinkle of additional fresh mint. This recipe tastes best with fresh carrots, especially the ones sold with greens attached (I also love the flavor of rainbow carrots when they’re available). However, it’s also a great way to use up leftover carrots if you’re not sure what else to do with them. To save time, I grate the carrots using the grating/shredding disc attachment. This is a very simple salad. If you want to spruce it up with some additional flavors and textures, try adding in some toasted, chopped peanuts and and raisins or currants. I love all the flavors in here with the carrots! What a delicious way to use leftover carrots! This is such a refreshing and easy side dish! What a great alternative way to serve carrots! Definitely using this for our next meal with carrots as our side. yum!!! I want this as a side for every meal!